Interested in joining PEAF? We are 429 members strong and growing. Join today! There are several benefits to becoming a member of our organization. Our members are close colleagues who have a great time when we get together. Of course we also have a common interest, and we hope to further our cause. 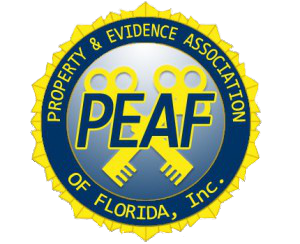 The Property & Evidence Association of Florida (P.E.A.F.) is a nonprofit association comprised of law enforcement evidence professionals from within the State of Florida. We have joined together for the purpose of education, information sharing, and networking to increase the level of awareness for our profession. Whether a person is employed by an agency large or small, a sheriff's office, police department, medical examiners office, educational institute, clerk of the court, or a state or federal agency, they can greatly benefit by becoming a member of P.E.A.F. If you meet the above criteria you are welcome to attend as a guest to meet and network with people in your field. Contact the President of your local Chapter to get started. Click here to join PEAF!